Christopher Collins advises clients across the financial services industry on regulatory and compliance matters and in relation to all types of financial instruments. He represents a wide variety of European and non-European clients including proprietary trading firms, investment managers, hedge funds, broker-dealers, trading venues and clearing houses. 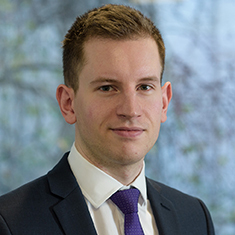 Chris joined Katten Muchin Rosenman UK LLP as a trainee in 2016, subsequently qualifying as a solicitor. Prior to starting his training contract, Chris worked in the legal and compliance department of a global investment manager.